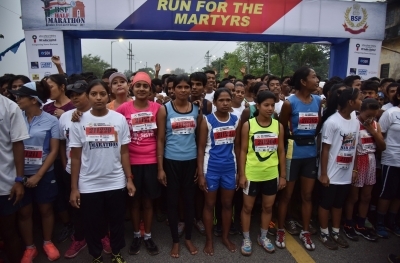 Agartala, Oct 29 (IANS) The Border Security Force (BSF) on Sunday organised a Half-Marathon – Run for Martyrs – here to commemorate the valiant deeds and supreme sacrifices made by the para-military troopers. 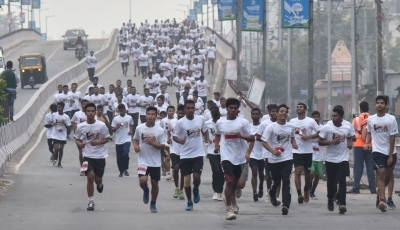 Around 1,800 people including women and people from all walks of life, besides the BSF, Assam Rifles, Central Reserve Police Force (CRPF), and Tripura State Rifles personnel took part in the 21-km and 5-km run. CRPF Inspector General B. S. Chauhan and his BSF counterpart Sanjeev Ranjan Ojha led the Half-Marathon. “BSF has been conducting this half marathon since 2012 to salute its martyrs. The event is being organised all over the country where BSF has been deployed, especially along the India-Bangladesh and India-Pakistan frontiers,” Ojha told the media. Sixteen families of killed troopers were honoured on the occasion. Prizes were also given to winners and the participants in the half-marathon, which attracts thousands of people.